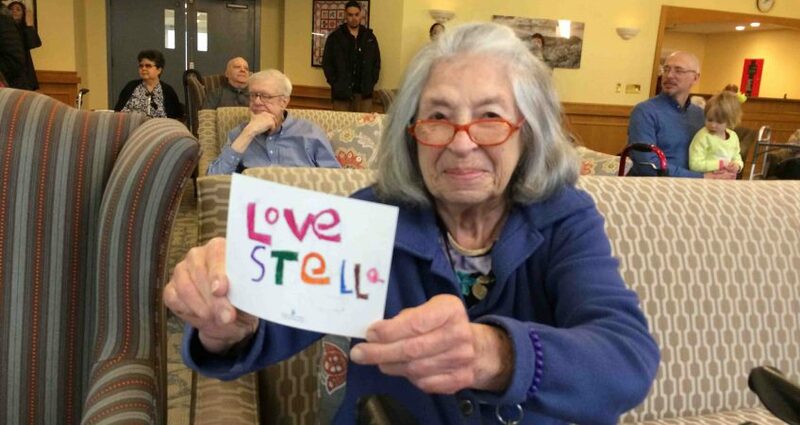 For the past 12 years, our Earth School students of all ages have taken twice-yearly trips to the nursing home in our community to visit with the residents. 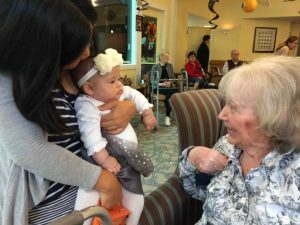 I had always noticed that young children really enjoy engaging with the elderly, and that everyone wins, the young and the old, through these warm and loving interactions. The children like to ask them questions, and they don’t mind if an elderly person gives them a warm hug, and they are happy to be there with them. It cheers everyone up, including the teachers and parents chaperoning, and it’s one of those win-win-win situations. What changed for me was when my mother moved into an assisted living home herself, and became an audience member for activities of this kind. I saw that the events and activities were more passive, that there wasn’t much for her to do other than listen or observe, and so it wasn’t really engaging. It seemed to me that there needed to be interactions, so that whenever possible, all ages could communicate and share in some way. 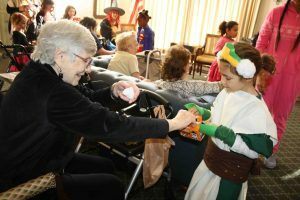 Over the years, it became a tradition for my students to visit the nursing home on Halloween, wearing their costumes, and to do a parade, sing songs, and collect money for UNICEF. The activity director gave the elderly residents handfuls of coins to give to the children, so that they could interact. The costumes allowed the residents to ask questions about what the children were wearing, and that opened up conversations. Watching the children talk to the residents, I thought about my husband’s grandmother, who did not live in a nursing home, but was lucky enough to live at home with her children and grandchildren and even her great grandchildren. She was 99 years old, and she would sit at the kitchen table, which was like the hub of the house, and as the various adults and children of all ages came and went in the course of their day, they had to pass by her. There she was at the table, holding her purse, and though she wouldn’t say much, they all had a chance to stop and give her a kiss and say, “Hello Grandma!” She was a part of the action, and it seemed to me that she was happy to be there, and it felt very natural to have her there, always at the center of the comings and goings of daily life. In Dr. Atul Gawande‘s bestselling book, “Being Mortal” (www.youtube.com/watch?v=mviU9OeufA0) he describes a similar situation in his native India, where grandparents of very advanced ages, seemed to live much longer and healthier and happier lives, because they were amongst family, and the energies of multi-ages all around them. His book is somewhat depressing to read, because he is pointing out how we are getting things wrong in Western culture, separating the elderly from our families and communities. I think most of us with aging parents are well aware of this, but sometimes, there is no way to take care of our parents ourselves, especially if they require special care. Still, there should be ways for the elderly residents of nursing homes to have more interactions with children, and there are some facilities that have day care centers on the property for this very reason, so there can be more intergenerational activities going on regularly. It reminds me of how separating out ages in traditional schooling has always seemed artificial and forced. It doesn’t seem natural for children to only play with children of the same age. It’s one of the beauties of homeschooling, and of Earth School, where students of many ages can work and learn alongside one another, help each other, introduce each other to new ideas and games, inspire one another and become role models for each other, younger to older and older to younger. Our students’ visits to the nursing home are not unique. Many schools and youth groups have set up regular interactive projects with the elderly in their community. It makes a huge amount of sense, whether it’s gardening or arts and crafts projects. But this is not always possible for the children to communicate with residents who have Alzheimer’s and dementia, who cannot readily engage, where interactions have to be more one on one. But this year, I had an idea. 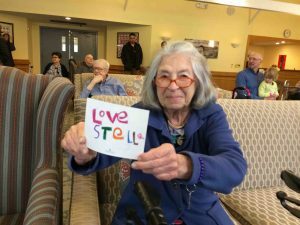 It had become a tradition for our students to also visit the local nursing home on Valentine’s Day, to give out handmade cards to each resident, and to sing love songs. On one occasion, as the children handed out their valentines one by one, a parent overheard an elderly lady say to the child, “You make me feel like I haven’t been forgotten.” That sentiment alone is worth everything and has stayed with me forever as a good enough reason for visiting. But I often wonder, is it enough? This time, something new happened during our visit, there was a moment that caught everyone by surprise, and I attribute this moment to the inspiration of a documentary called, “Alive Inside” In the film, social worker Dan Cohen explains that for patients with advanced Alzheimer’s and dementia, there is still a part of the brain that connects to music, specifically to one’s favorite music, and if this area of the brain is stimulated, it is connected to other areas of the brain that then also get stimulated. The result is that the elderly person experiences a kind of reawakening of parts of the brain that are connected to memory. I had tried an experiment after seeing the film for the first time. My mother was in a nursing home for 5 years, with severe dementia. She could still recognize me, and would light up when she saw me. But she couldn’t name me, or my daughter, and she couldn’t speak in full sentences that made any sense. The words were all jumbled together, even though I knew she was trying to say something. I knew she was aware of us by how she smiled when we entered the room, but she couldn’t interact with us. In “Alive Inside,” the researchers demonstrate how to take an elderly person’s favorite music, from his or her own era, and using headphones and any handheld device, allow the person to hear this music and sit with him or her while this happens (an essential part of the process, because as the patient begins to come alive, expression and conversation are needed). So I loaded my iPhone with Frank Sinatra, and after consulting with my father, put on my mom’s favorite song, “Strangers in the Night,” placed the headphones on her ears, and waited. As she listened, within moments, a huge smile came across her face, and she laughed, she hummed along, and after a few minutes, she looked me in the eyes and she said, “You are my daughter. You’re Barbara.” It was like a scene from the movie, and it was completely awe-inspiring and beyond imagining. 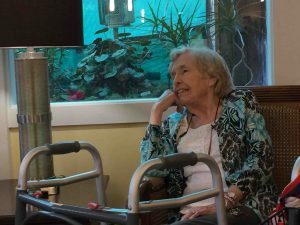 This experience made me realize that all the years that we had visited the residents of the nursing home, we had been singing songs that the children liked. That meant that the residents listened, then clapped at the end of each song. But there was no real interaction possible, it was more like a performance, and of course the children were adorable and sweet, and everyone loved listening to them sing, but I realized we could do more. Our music teacher was excited by the suggestion that we sing songs from the era that belonged to the residents, and find songs that they were likely to remember well and be able to sing along with. She did a fantastic job finding songs that our students enjoyed singing, that were fun and simple enough for everyone. So on Valentine’s Day, armed with loads of handmade valentines, the children stood up in front of the residents, many of whom were dozing or not fully present, and they sang a series of love songs from bygone days, including, Dean Martin’s “That’s Amore!” and Louis Armstrong’s “What a Wonderful World.” With delight, I watched and listened while the room resonated with singing voices, and the residents joined the children in song. There was one gentleman who sat near the front of the room, and he was not really moved by the singing. In fact, he spent the entire time reading the newspaper, or at least turning the pages of the newspaper over and over. He was not particularly interested in the valentine he was given, and he was definitely not watching the children sing. My sense was he just wasn’t having any of it. But he was very noticeable, as he sat at the very front of the room, turning the pages of the paper. Then the children started to sing, “What a Wonderful World,” and all of a sudden, I heard this powerful male voice singing along with them. I looked around the room, and located the source: it was coming from this gentleman. He had paused from his paper, looked up, and sang in full voice, the most beautiful voice: “What a wonderful world!..” It took my breath away, and I began to cry. It occurred to me that this is why we were here this day, for this one man. I know the children inspired others too, there were many singing along and smiling and clapping. But for this one day, for this one moment, something they did connected for this gentleman. And it was enough, for that one moment, it was enough. Beautiful – so moving. Thank you. Wow! Thank you for this share! Truly inspiring! So deeply touched by the beautiful work you’re all doing, sacred work. We have a tendency to get so caught up in the busy-ness of day to day transactions in this world that is sometimes very un-human. Thanks to you Haley, the children, and all of the caring individuals at Something Good in the World who keep compassion and love part of the lesson of the day. Happy Spring!! Keep Blossoming. Loved Being Mortal for all that it allows us to see…as does this. Perfectly described, something l also learned by accident while participating in a music therapy session with elders thirty years ago. Why these aren’t a regular part of their social life in such communities shows how we have to keep on proving the obvious when it comes to intuitive common sense. Miss you guys!! Wow, that must have been so powerful to witness! Thank you for connecting children with our aging ones. I can hear the man singing “What a wonderful world.” Stories like this and people like you make it wonderful. Beautiful.